Feb 2017, Big Billy Bill at LOZ. Big Spot. River City Bass Club posing outside of the Omaha Against Hunger subsidiary of Kids Against Hunger, Feb 04, 2017. Pic from the assembly line inside of OAH warehouse, 2/4/17. Pic finished product inside of OAH warehouse, 2/4/17. 720 total packages containing 6 meals per package = 20 boxes for a total of 4320 meals (in 49 minutes!!!!!!). Dave McCoy, April 2016, Central Regional, Bass Nation, Guntersville. "Parris" Humm, April 2016, Central Regional, Bass Nation, Guntersville. 2010 Federation Tournament; Doug on the Dock. 2010 Federation Tournament; Dan Radebaugh (left) and partner. Dave McCoy (Left) on the dock at the 2010 Federation Tournament. Doug's 6.13# from FoMNTT, 3-Mile, Aug 2011. 2012 State Regional qualifiers! McCoy and Adams made the Regional Team by placing 7th and 10th respectively. This is McCoy's umpteenth Regional (Congrats), but the story here is Adam's journey to get to a regional only in his second attempt! The Club is very proud (of both of you) but especially proud of Adams. 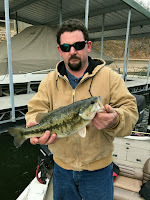 Adams (fished as a Co) capitalized on his boater's spots all three days, but when given the front on day 2, really took charge catching 3 fish off the same spot (with one being 5+#), using a technique [wacky/flick shake] he learned just 2 days before. Awesome accomplishments to you both! 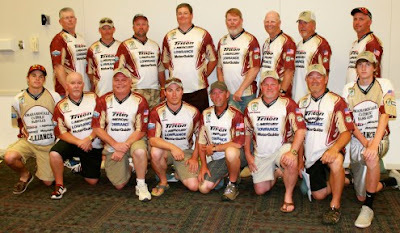 2013 Nebraska Regional Team: Rick R. in the middle (6th head from Left). 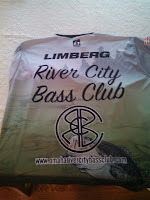 2013 NE Fedration Nation State Qualifier, Lake of the Ozarks, Big Bass of the Day winners. Rick Riley (of River City--on right) day two winner with 6.44#. 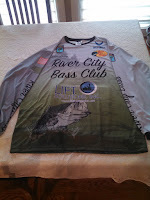 Rick's 6-01 from Banner Creek, 2012. Ricky and Duane rescue Doug and Kevin after over an hour of pushing. In retrospect, we (Doug-victim, JR, Duane, and Ricky) wished we would have recorded the removal for a YouTube viral hit... But we didn't. The snagging took place right at the ramp on the last cast of the day, the removal occurred at the Ft Randall Inn, in a chair, on the sidewalk in front of our rooms. Outcome: Complete success! That baby popped right out! A word to all future stuckees, "It stings like a wasp sting for about 10 minutes, and it was over." JR and Dave M., N2IT, Mozingo, April 7, 2013, 19.39#. The 2013 Mr Guppy recipient's special gift. Back. The 2013 Mr Guppy recipient's special gift. Front. 2014 Regional Team, featuring our own Ricky Riley (middle-front) and Brad Shaefer (front-left). Duane hits the big bass of (2013 &) 2014 pot on the last morning of our Truman tournament. 5-08#. Buzz bait. Oct 19, 2014. 5/5/16: RIVER CITY BASS wins 2016 State Team competition at Grand Lake 'O' the Cherokees!!!!! The team amassed 134+ pounds in three days, eclipsing second place by more than 16 pounds. Row 1: Bill, Tim, Dave M.
Row 2:: Jason, John, Doug, Dave G, Duane.